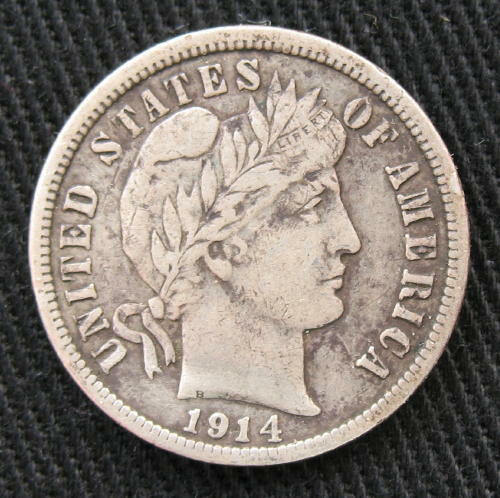 The Barber Dime made its introduction in 1892 and was produced through 1916. The dime obverse design is similar to the Barber Quarter and Barber Half Dollar. As with most Barber coinage, it was heavily used so surviving pieces are typically worn and not worth much over melt for more common dates. Coins in better condition though will carry decent premiums. Anywhere from a few dollars and up. The dime pictured below, while worn, is still in decent shape and shows the word Liberty in the head band. Coins of this condition and better will carry better premiums. Of course, values will depend on date, mint-mark and condition. If you have a hoard of Barber Dimes, please contact us for a offer. We will buy all silver coins dated 1964 and before.